The Coelophysis was a small carnivorous dinosaur whose existance dates back to the Triassic period over 228 million years ago. It owes its name to the Greek root word “Koilos” which refers to something hollow while “Physis” simply refers to a form or structure. Their name emphasises their light and hollow bone structure. The very first specimens of the Coelophysis were first discovered in 1881 by David Baldwin and was quickly named C. Baur. However these fossil samples were not enough to give scholars any real data on this new dinosaur species. While researchers continued to work, it was in 1947 that a huge grave of Coelophysis fossils were unearthed in the Ghost Ranch in New Mexico. Not only was this a great find but it was the first time such a huge collection of dinosaur fossils had been excavated in one go. Finds like this usually presume that these dinosaurs were swept away as a result of some natural hazard like a flash flood and buried instantly. The Coelophysis was initially considered to belong to a single species, that of the C. Bauri. However, there are two other kinds which have been recently added as a variant of this type, namely the C. willistoni and C. longicollis which are known to have no other similarities except that they all belong to a similar genetic structure. The Coelophysis was a slim theropod which was probably as long as a car but as light as a 7 year old. 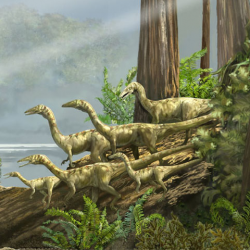 They were one of the earliest dinosaur species and despite only being 2-3 meters in length were vicious pack hunters. There light weight and hollow bone structure was a big deal and despite being a theropod, their early existance meant they carried several features which were considered to be the first of a kind in dinosaurs. Other features such as having 4 digits on each hand as opposed to 3 offers a great example of features which were later lost by theropods. These early dinosaurs had a long head, an elongated snout and a noticably long curvy neck. Add to this extremely slender limbs and this reptile almost resmbled a bird. However unlike birds the Coelophysis had teeth, clawed hands and a long bony tail. The most interesting section of the body was probably their vertebra which were arranged in such a way that they prevented the long tail from constantly moving up and down. This combined with their super light weight may have contributed to their ability to commute swiftly. Most of the information regarding the life and times of the Coelophysis was obtained from the fossil specimens that have been discovered from the Ghost Ranch in New Mexico. As stated before the Coelophysis were meat eaters and probably hunted other small lizards and small mammals. Not dissimilar to scavengers, they probably hunted in packs and pounced on their prey digging their edged and jagged teeth into their prey. Their teeth were extremely sharp on both edges and therefore easily pierced unarmored skin. Like most hunters the Coelophysis probably lost and regrew its teeth throughout its lifetime. Severeal researchers have also pointed that in their initial stages the Coelophysis may have displayed cannibalistic traits. This claim was originally supported by various studies of the abdominal cavity of certain fossil specimens which revealed the presence of other Coelophysis samples. Whether this is 100% accurate or not is debatable as other scientists believe those specimens were in actual fact Crutotarsan reptiles.